We have just received A stitch in Color charm packs and jelly rolls by Malka Dubrawsky and Sassy jelly rolls by Sandy Gervais both from Moda. Both lines are very different from each other, which makes it harder to find a favourite. 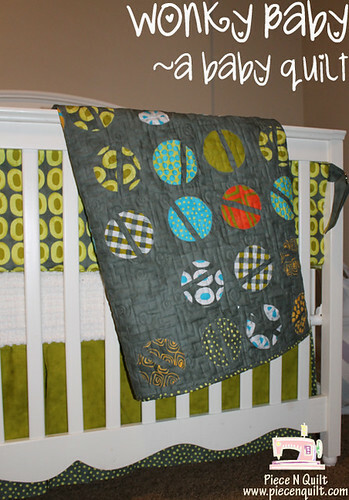 In the mean time I leave you with a link of what to do with 2 of the A stitch in color charm packs, Wonky Baby quilt. I don’t know if it happens to you but the more I sew, knit, crochet or stitch I want to do, sort of a crazy addiction. I have noticed that when I am sat watching tv of waiting for something I want to do some sort of handcraft… sometimes is cross-stitch some other times is knitting but either way I just see it as an opportunity to do something. 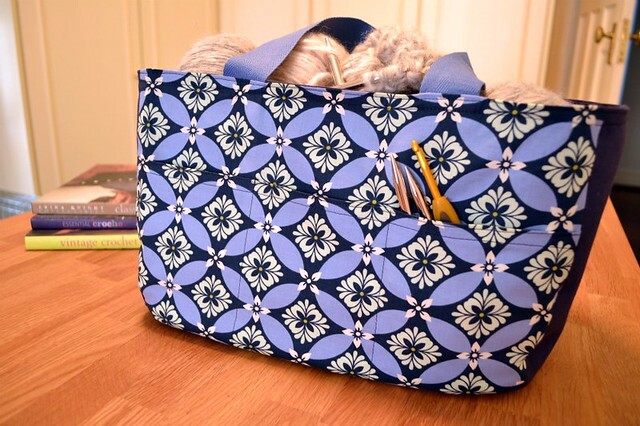 I usually drag my projects from one sofa to another in a shopping bag or an old handbag, so I thought it was time to make a proper caddy for my stitching… and here it is! I used Sandi Henderson’s Modern Meadow in Midnight as the main fabric and some navy blue canvas that I had in my stash. I was very tempted to use Vintage Ironwork or any other of the fabrics from the same collection, but the first fabric is so pretty and bold that I wanted to really give it central stage and use a solid fabric for the rest of the bag. I followed the original pattern to the letter, it has 3 front pockets (can you see them??) and 3 dividers inside. As I tend to have more than one project on the go (and who doesn’t?!?!) I am thinking of making a second one, this time without the dividers and using 2 (or maybe even 3) of Riley Blake’s Daisy Cottage fabrics. A dear friend of mine had her first baby not long ago and I wanted to make something for her baby girl. I tried to knit a pair of baby shoes but dpns and I just don’t get along. I managed to finish 2 shoes but you should have seen them! They looked so different from each other that I thought I had used a completely different pattern for each one of them. Afther seeing so undeniable facts, I decided to play it safe and turned back to sewing, and I am so pleased I did as I couldn’t be happier with the results. I knew straight away which fabric I wanted to use, this fabric is cute at its best and I have been waiting the right moment to use it, and now this moment has arrived. I don’t know about you but I think Japanese fabrics have that extra sweet touch that makes them perfect for a gift. I went for a very simple pattern as the fabric is so pretty that it doesn’t need any help from complicated patterns. I had a bit of flannel in my stash that worked perfect as lining and I was ready to go. 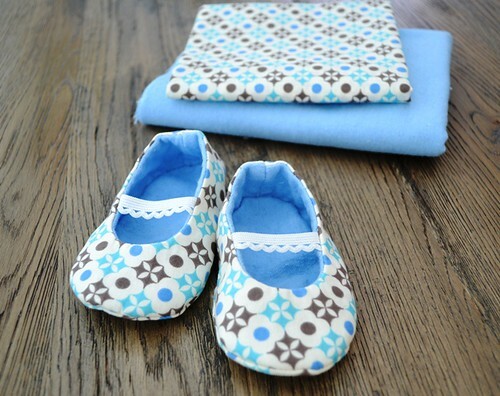 I enjoyed making this tiny little shoes, I don’t usually sew for babies, but I found it great and gratifying that you finish baby things so quick, besides you use so little fabric that I think I will be making more presents than buying them. I would love to make a baby quilt with these fabrics (Children at Play by Sarah Jane)… so if you know of a good pattern for them let me know, I am on a roll here! We are so happy with all the different combinations of fabrics and colours that all of you came up with that we are planning a few other things, but we will let you know once we have something.